hi. i cant seem to upload wav files to sd card and play them. when i open file manager its completely blank, empty page. and im getting this message when i click upload. it might be it's a pretty basic issue, if so i appologize (im working on my first ever patch). 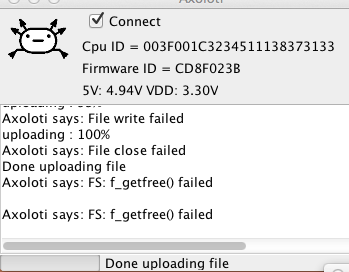 Personally I dont use Axolotis own file uploader. I think it is much easier putting the SD-card into a computer and just copy/paste the files on to the SD-card, like any usb pen or harddisc. BUT.... Remember to format the SD-card with Axolotis formatter first. This is from what I understood really important, that it is formattet with Axolotis formatter and now OSC or windows. into a patch and go live and follow instructions form object. Then it should format the sd-card. deleted and installed all again, now it works! Hi I have the same problem even using the util format, it allows me to upload only 8mb files. Any help?